Switch to the DEHYDRATOR turn out gear drying system! Eliminate wet gear in your fire department with the patented DEHYDRATOR, complete and ready for installation at your firehouse. We present to you , the truly functional fire and rescue turn-out gear storage Fire Turn Out Gear Rack, designed and built for firemen, by firemen. The Fire Turn Out Gear Rack's hand welded structural aluminum frame provides adequate spacing of stations, to accommodate full fire turn-out gear including: coats, bunker pants, helmet, boots etc.. 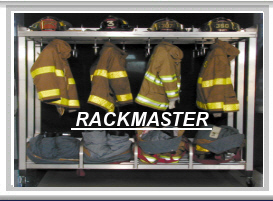 Rescue gear can also be stored on the same rack. 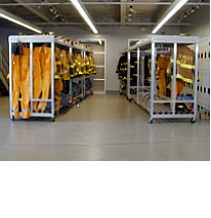 Fire Turn Out Gear Racks provide mobile, valuable turn-out gear storage space, with high quality design and construction, to last a lifetime. These rackes are custom built to your requirements in sizes to 12 feet in length. Units are constructed as single, double or wall mounted (12 ft. double shown above). Using the DEHYDRATOR in - house drying program in conjunction with a standard in - house washing machine, can be the best alternative to expensive cleaning services. Also most importantly, FEMSA recommends that the gear is not dried in a tumble dryer, the excessive temperature and tumbling action can be detrimental to the gear. It can cause excessive shrinkage and premature failure to the protective garments. What's more, FEMSA opposes drying garments in direct sunlight. 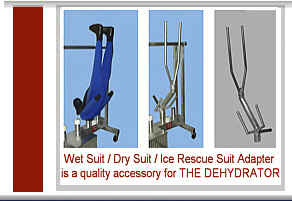 The Drying Answer....Choose the DEHYDRATOR drying system that is designed to accelerate the time required to remove the moisture from various types of "difficult to dry" turnout gear. This is achieved by blowing a flow of warm heated air into the interior of the hanging items. Air drying alone can take at least 24 hours, while humid weather can add to the time and if left hanging long enough, it can lead to mold and fungus contamination. and the Rescue Suit Dryer Adapter. These adapters accelerate the drying time required, the Mask Drying Adapter aids in preserving the lens, due to its non direct contact thus removing the potential for scratching the lens.